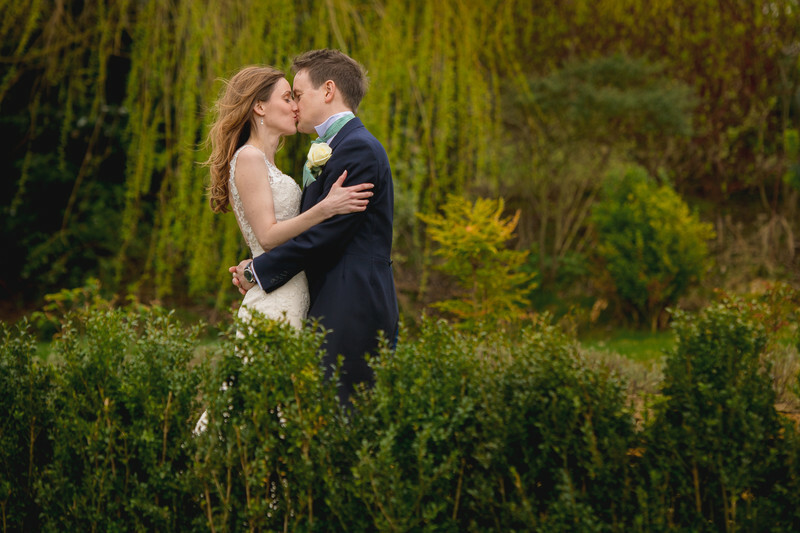 Sally and Matt got married at Deer Park hall on a very blustery day in summer. Sally and her bridesmaids got married in the couple's home whilst Matt was getting ready with his best man. I had spent all morning with the bride, getting some lovely bridal preparation photos, even if she was extremely nervous! I left Sally's house roughly 30 minutes before she was intending to, ensuring that I could get to Deer Park Hall in enough time to take some photos of the venue, as well as her soon-to-be husband before she arrived. Once these pre-wedding photos had been taken, I made my way outside to wait for the arrival of the bride. The first car pulled up containing the bridesmaids, and a few moments later the bride's car followed. I positioned myself so I could get a photo of the bride getting out of the car. Shooting from this position is always a risk as there's a chance the father of the bride can stand in the way of the bride and block the photo. This time though we got lucky, and the bride's father hung back far enough that I could still get a clear shot of the bride. I like how in this image the bride is framed between the back of the bridesmaids car and her father. I really like the black and white conversion here, with both wedding cars being dark, and the father of the bride wearing all black, the only light in the image is from the brides dress. When I exposed for the dress, it made everything else in the image darker still, making the dress stand out. I think this is the perfectly caught moment, the image tells a story and presents the dress for the viewer to see at the same time. Once the photo of the bride getting out of the wedding car was taken, I ran back inside to capture the moment that the bride made her grand entrance and walked down the aisle. 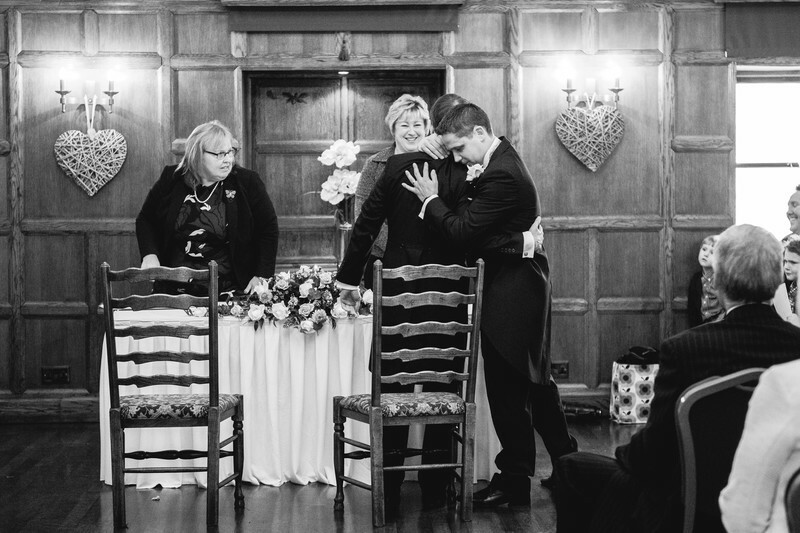 I knew that the bridal party were going to make their way to the back of the wedding ceremony room at Deer Park, so was stood at the back of the room when I saw the groom and his best man have this wonderful emotional moment at the front of the room. I really like the reactions of the two registrars - one with a look of concern and the other smiling at the pair! For the remainder of the day, it remained overcast and the wind was gale force. Luckily, Sally and Matt were great sports and we still got outside for some lovely photos of the newly married couple.